The pioneering solar-powered airplane Solar Impulse 2, which flies without fuel or producing emmissions, will arrive in Egypt in July, as part of its round-the-world journey to promote renewable energy. Civil Aviation Minister Hossam Kamal welcomed the idea of receiving the aircraft in Egypt, saying the craft is an important development in the civil aviation industry due to its potentially positive impact on the natural environment. Egypt is preparing all the necessary facilities and logistical support for the arrival, including licenses and technical services on the ground. The minister expressed an interest in exploring new technical developments within the aviation industry, especially those related to promoting environmental protection through renewable energy sources. He also said that the plane's arrival would attract many foreign visitors. 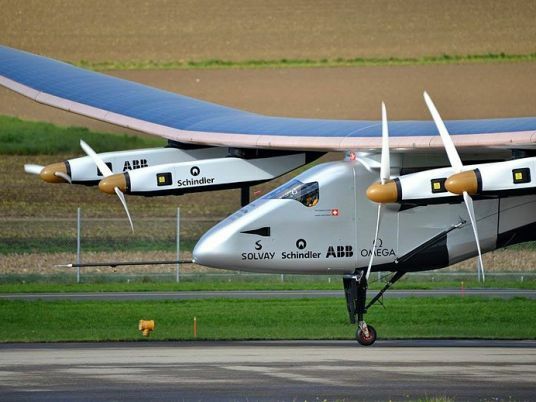 The Solar Impulse 2 has 17,000 solar cells on its wings, which recharge the plane's batteries throughout the day. The wings are 72 meters long, giving the aircraft a stunning, slimline appearance. The Solar Impulse 2 took off from Abu Dhabi on March 9, 2015 and flew eastwards across Asia, clocking up around 18,000 km. It is currently located in Hawaii and will resume its journey on April 20, flying to three loctations across the United States, then to Spain and Egypt before going back to Abu Dhabi. News of the plane's visit to Egypt coincides with the signing of a contract to build Egypt's first eco-friendly airport, at Borg al-Arab city, Alexandria.